I think spring is my favourite season because you don't have a great expectation of the sun being out all the time. 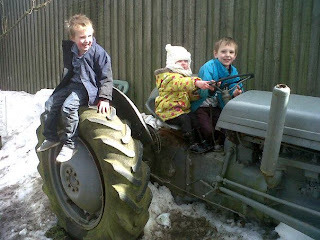 I love taking the kids to the farm, we are really lucky to live near the countryside and we have plenty that we can visit around us. 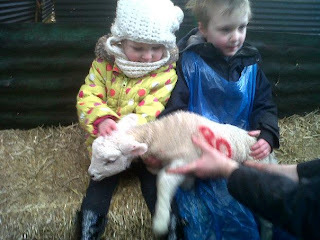 In the last half term we visited 2 different farms. We saw 2 lambs being born in one farm and got to have a hold of some lambs that were only hours old. The other farm we went to was called Glebe farm its actually the first time we visited and it was fab! They were plenty of animals to feed. There was a cow called Toby! Little tractors for the kids to play on and a little cafe that we had gorgeous bacon butties at. But most of all I'm looking forward to sitting, playing and hanging out in the garden. Last week Dave lay some turf in the garden, so for the first time in about a year we have grass! Apparently they can't play on it for about 6 weeks but we will have to see how it 'grows in'! What do you think of our newly turfed grass?